From laser hair removal to electrolysis, here’s how to get silky smooth skin before the big day. A wedding is often the time when brides rethink their relationships with body and facial hair. Should they break up with their razors in favor of a method that allows them to live happily ever after with a clean upper lip, hairless underarms and smooth bikini line? 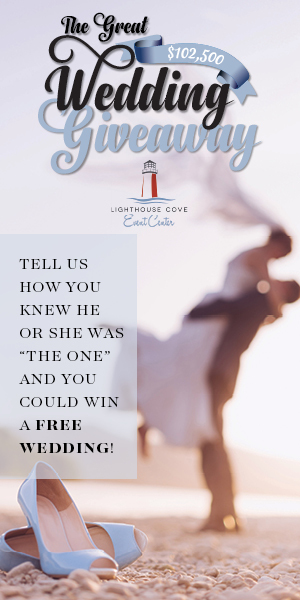 Like marriage, this isn’t a decision to be made lightly. There are a number of hair-removal methods to evaluate. Laser hair removal has been growing in popularity for years. Is this effective procedure right for you? 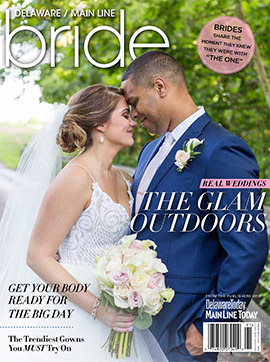 Start treatments at least six months before the wedding says Christina Buckey of MagnifaSkin MedSpa. Avoid getting a tan while you are going through laser treatments because that will diminish the results, too, Dr. Chang says. That rule of thumb also applies to spray tanning and self-tanning lotions. “Tanning reduces the contrast in color between your hair and your skin, which means the laser won’t be as effective,” he says. If you are getting laser treatments for facial hair, don’t schedule a treatment if you have a cold sore or an acne breakout. The heat of the laser can make those conditions worse. Also expect to feel a mild “zap” during the treatment, which quickly subsides. Lasering removes 70-90 percent of hair, so expect some maintenance. “Getting rid of a few hairs every now and then is not a big deal compared to constantly shaving,” says Chang. 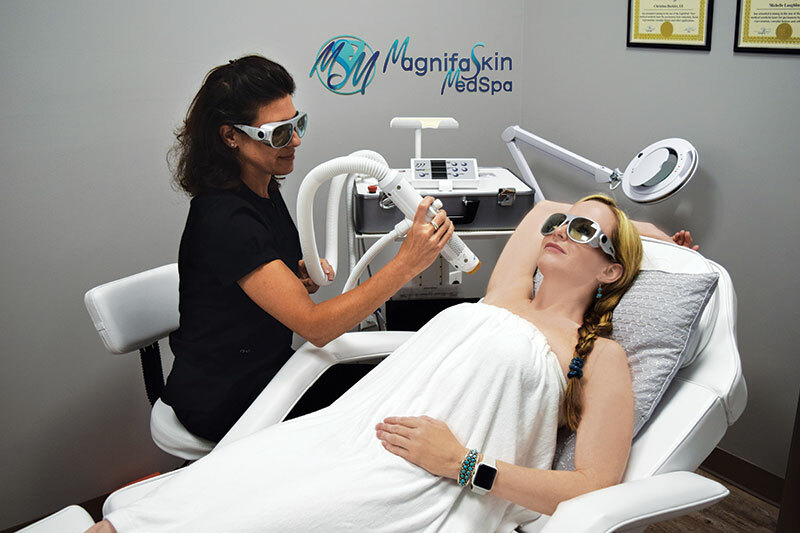 Start treatments at least six months before the wedding, says Christina Buckley, who owns MagnifaSkin MedSpa in North Wilmington with Dr. Tony Cucuzzella. The process requires multiple sessions scheduled every four weeks. “Brides like it because they get a smoother, cleaner look,” she says. Underarm hair removal is a favored option for brides wearing strapless gowns. The bikini area is important for honeymooners headed to a tropical location. Its also is less expensive and takes less time. The average cost for laser hair removal is $235 per session, according to the American Society of Plastic Surgeons. Waxing is about one-fourth of the price, depending on the area that is being treated. Waxing also is precise enough for brows, which laser hair removal is not. 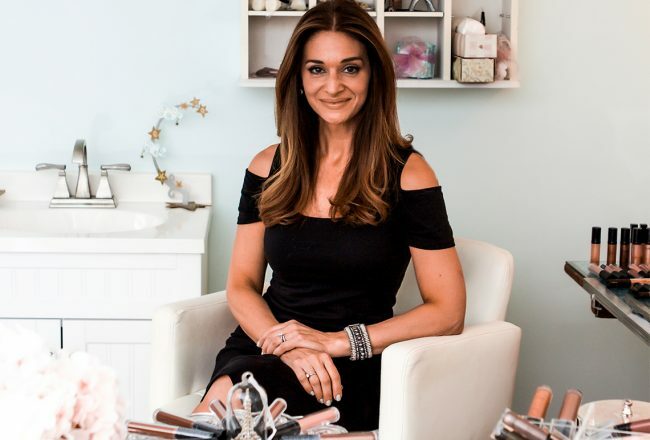 For optimal results, Katarzyna Kowalski, a holistic esthetician in Glen Mills, Pennsylvania, suggests brides start waxing six months before the wedding to address various cycles of hair growth. Waxing pulls hair out by the roots. To grow back, the follicle has to produce a new root, which means the area remains smooth and hair-free for four to six weeks. When it does grow back, the tip of the hair is soft and thinner. “When you shave, it grows out in a stubble because the hair was cut,” she says. Shaving only hurts when you cut yourself. But there is momentary discomfort associated with waxing. Want to say goodbye to hair forever? Electrolysis is the only method of permanent hair removal recognized by the U.S. Food and Drug Administration (FDA). It works by inserting a slender probe into each individual hair follicle to kill the root with an electric impulse. Going hair by hair takes a long time, says Emily Jones, who provides electrolysis at Wynnewood Salon in Pennsylvania. Treatments on the chin can take two years. Unlike laser technology, the color of your skin or hair doesn’t matter in electrolysis because the technique targets the root of the hair rather than melanin. Ethnicity is significant in that it typically determines who has the most body hair. “The hair on our bodies is there to protect us from the sun,” Jones says. There is some pain involved in electrolysis, which can be reduced with topical anesthetics. Increasingly, people are turning to electrolysis in combination with laser hair removal, using the laser to quickly address larger areas of hair, and electrolysis to deal with hormonal hairs and growth that resist the laser. Here are the pros and cons for six popular hair-removal options. DEPILATORIES: Creams, gels and sprays dissolve hair below the skin. PROS: Easy to use; Inexpensive, immediate results. CONS: Must be repeated regularly; can irritate skin. ELECTROLYSIS: Requires an investment of time and money. It works by destroying the follicle, so hair doesn’t grow back. PROS: Permanent hair removal. CONS: Requires multiple treatments; may cause mild discomfort; more expensive than depilatories, shaving and waxing. LASERS: Can cover an area the size of a quarter. PROS: Results last for years; removes 70-90 percent of hair in targeted area. CONS: Requires multiple treatments; may cause mild discomfort; expensive and less effective for fair-skinned blondes and people of color. SHAVING: It’s simple and it works. Repeat as needed. PROS: Immediate results; low cost. CONS: Lasts only a few days; can result in razor burn, stubble and ingrown hairs. TWEEZING: You can do it yourself but consult a pro when it comes to your brows. PROS: Accurate, effective and inexpensive. CONS: Suitable only for small areas—such as brows and upper lips—and touchups. WAXING: An aesthetician applies hot wax to an area, covers with a strip of cloth to remove hair. Sugaring is an alternative in which hot wax is replaced by a sugar paste. 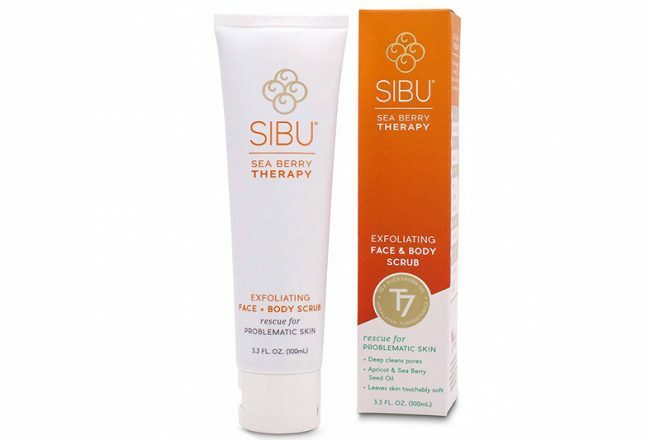 PROS: Creates a smooth appearance that lasts for up to six weeks; less expensive than lasers and electrolysis. CONS: Treatment requires allowing hair to grow out. Expect to say “ouch” when the strip is pulled away. 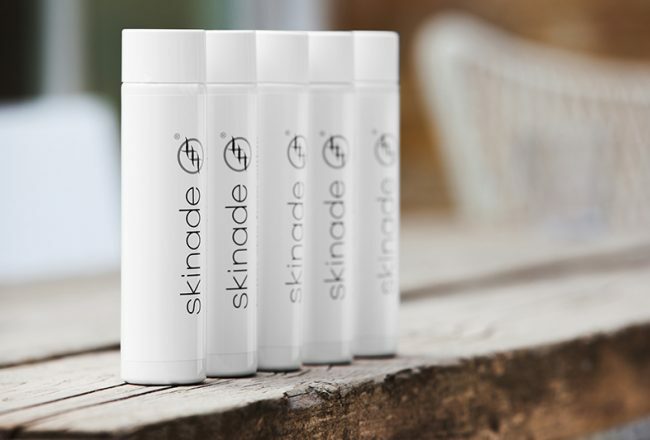 When the winter wind blows, Frances Thrasher cleans and protects her skin with Kindred Skincare’s oil-based exfoliant, removing dead skin cells that are a barrier to youthful radiance. 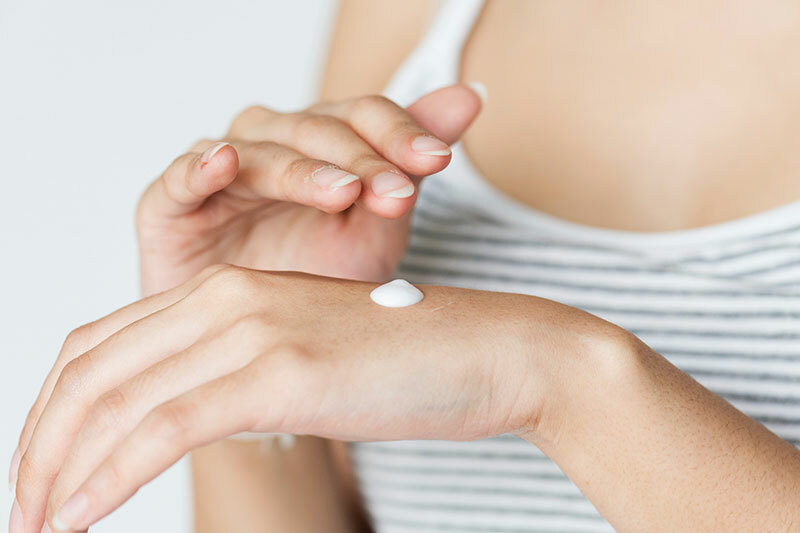 It’s the same product she recommends for brides intent on looking their best despite the season’s assault on skin, hair and nails. You will need to start a good skin care regimen at least a month in advance to see results. Take a picture when you start and compare the texture and color of your skin each week. Start the big day with a single-use clay mask, hand-batched from a blend of clays and botanicals. “Kaolin clay removes redness and bentonite clay excites the skin and plumps it, a lovely thing to do before makeup application,” she says. Kindred Skincare products are available at Houppette, Terrain in Glen Mills, the Spa at Montchanin Village and online at kindredskincareco.com and neimanmarcus.com.